For the past nineteen years, the Classical School of Golf has offered junior golf camps for the spring, fall and summer seasons. I have had over a thousand kids come to my golf camps. The spring and fall camps are after school programs, providing junior golfers with the opportunity to attend one day a week for a period of six weeks. The summer camp is a three - week series, giving the juniors the opportunity to attend one, two or three week 4 1/2 hour daily sessions. 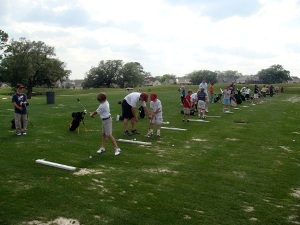 Due to limited golf course and range areas, each session is capped at 40 juniors. The Classical School of Golf takes pride in giving each junior the personal attention that he or she deserves, by ensuring one instructor per four students. Traditionally, there is a waiting list of juniors hoping to enroll for each session. 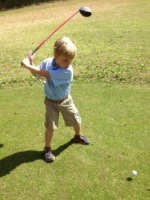 Hands on instruction is comprised of the teaching of basic golf skills and etiquette, both on and off the golf course. Each session is ended with a tournament and an awards luncheon following play. As an expression of achievement, the juniors are rewarded with medals and trophies for their accomplishments. Parents are always invited and encouraged to attend the awards presentation. Get a Junior Golf Application.